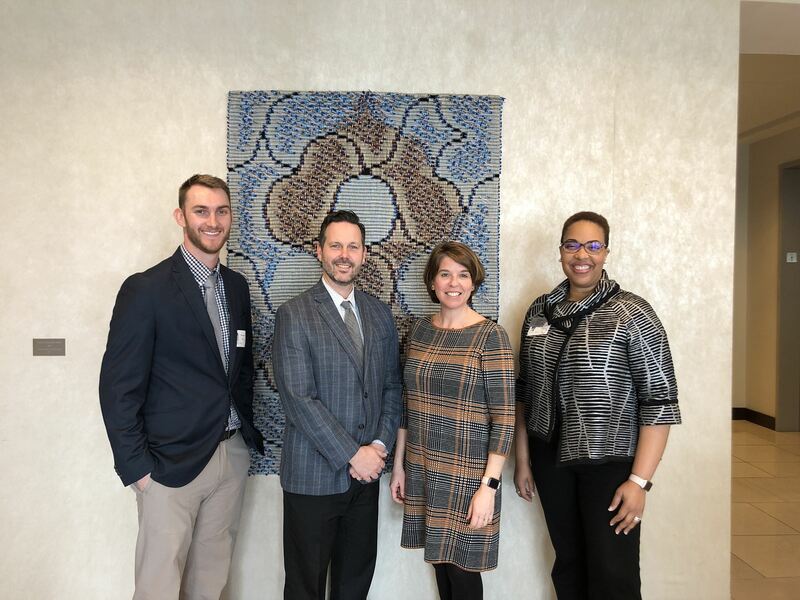 Legislative Advocacy Day was held Tuesday March 19, 2019 at the Riffe Center in downtown Columbus. Here are some photos from this record breaking event. The Standard Authorization Form is now in the Ohio Administrative Code! Effective early February, providers will be required to accept the new form which will help ensure that health information essential to care and treatment is obtained in a timely manner. HERE is a fact sheet that includes direct links to a fillable Standard Authorization Form and Instructions. Later this month an instructional video will be available to help educate the field about the new requirement and how to fill out the form. Dissemination and education is critical to the success of this effort, so your help in letting your respective members know about this change is greatly appreciated. Yegan represented OCA before the House Family and Community Advancement Committee on May 16 providing proponent testimony on HB 523! The CSWMFT Board also provided remarks at the hearing. Yegan didn’t get any questions, but Brian Carnahan (Board President) got a couple focused on how other states handle licensing those coming from out of state. He answered that Ohio has some of the most rigorous licensure requirements, so it is generally assumed that if you can get licensed in Ohio, you can get licensed in other states. The members wanted to ensure qualifications weren’t being watered down in order to allow additional practitioners. That is OCA’s goal as well, so we are pleased with the committee’s questions. Rep. Vern Buchanan (R-FL) has introduced H.R 5531, The Opioid Emergency Response Act. The bill contains a seven-point plan to address the opioid crisis, one of which is lifting the exclusion of counselors from the Medicare program. Rep Buchanan is a cosponsor of H.R. 3032, our standalone Medicare bill, and he made it a top priority to have the measure included in this legislation. This legislation is a key part of the NBCC's strategy to get our Medicare bill included in the congressional opioid package. This is perhaps the best opportunity there has been in years to secure Medicare coverage for counselors! 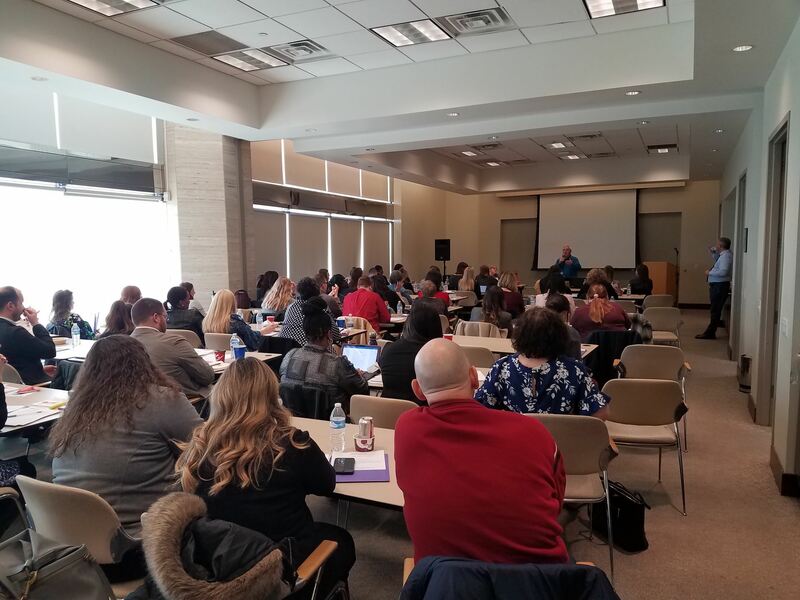 The Ohio Counseling Association is participating in/working with the Ohio Parity at 10 Campaign to disseminate a provider knowledge survey. The goal of the Parity at 10 Campaign is to expand access to mental health and substance use disorder services through strong enforcement of the Mental Health Parity and Addiction Equity Act. 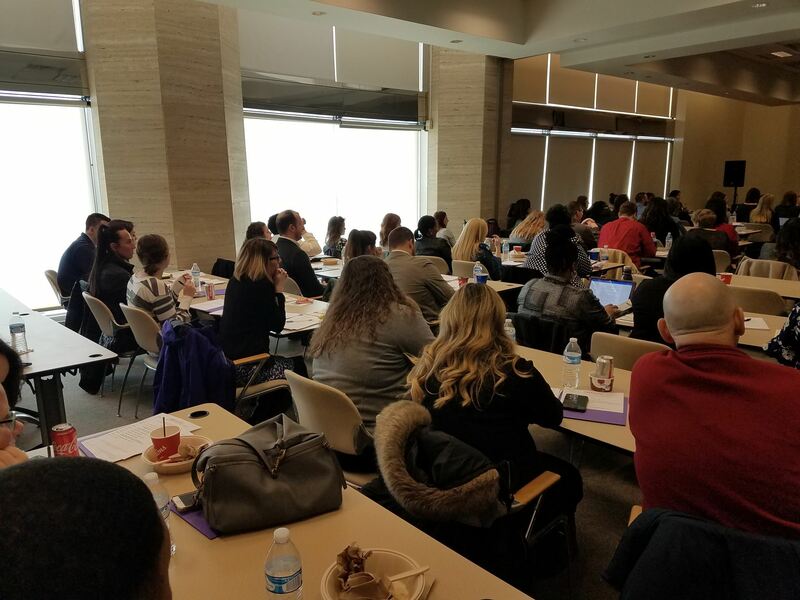 The Ohio Parity Coalition is working with five national organizations—Legal Action Center, The National Center on Addiction and Substance Abuse, The Kennedy Forum, Partnership for Drug-Free Kids, and Public Health Management Corporation—on this campaign. The national organizations have drafted this survey with local input. The provider knowledge survey will help us better understand what providers of mental health and substance use services know about the federal Parity Act. Results will be used to develop educational materials and strategies designed to assist providers in utilizing parity laws to expand patient access to care. We are asking that you and as many staff as possible complete this survey. This may include staff who provide direct clinical services or administrative support as well as senior leadership. Please share this e-mail widely within your organization. We would like many different types of providers (e.g., social workers, physicians, psychologists) and staff members (e.g., billing specialists, program directors, benefits coordinators) to take the survey. This will give us the best understanding of what parity education or technical assistance may be the most helpful to different individuals who are involved in the delivery of treatment services. The survey can be accessed by clicking on http://bit.ly/provider_survey and takes approximately 15 minutes to complete. We want to keep you informed as to some important developments in our efforts to oppose the proposed Board consolidation efforts. We mounted a successful grassroots campaign in December to block this legislation, and again this past month as it became part of the Governor's budget bill. Just this week, the House removed that legislation from their substitute bill, so this is GREAT news for us! Thank you to all who have worked to get the message to your representatives that OCA opposes any attempt to eliminate the CSWMFT Board! We do need to continue, and will be continuing to oppose any consolidation efforts. The next step is to keep an eye on what the Senate will do with this proposal. 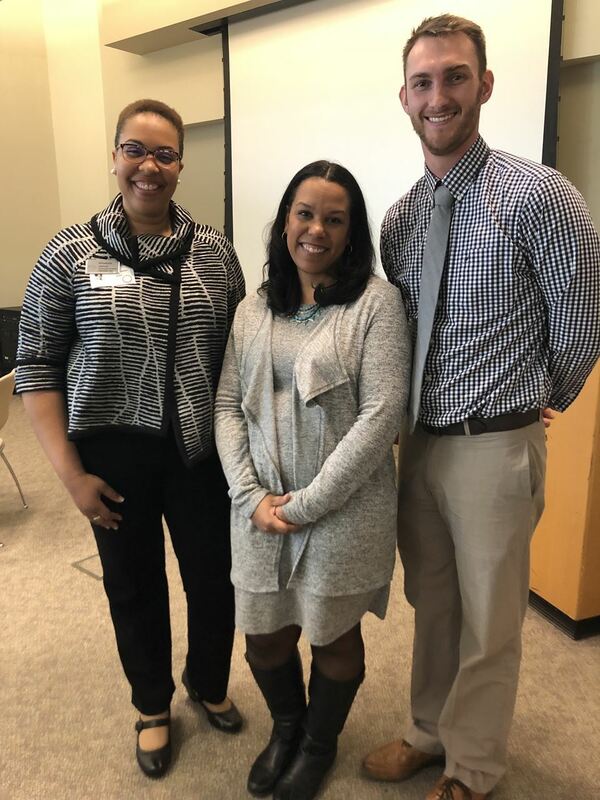 As part of our Legislative Advocacy Day on Wednesday this week, we had opportunity to speak with State Senators about our opposition to this, and we will encourage you all to be aware and to be ready to take action. If the Senate attempts to put this proposal back into their version of the budget, we will definitely let you know so that you can contact your Senators directly. Thank you again for your work in supporting OCA and for participating in protecting our profession. As we renew our stand against the proposed replacement of the CSWMFT Board, many of you have asked for talking points so that when you contact your representatives and senators, you can know how to communicate our concerns. I'm attaching a letter that has been sent out by the coalition of behavioral health providers who would be impacted by this proposal. I would encourage you to use the points made in this letter, and to share it with other professional colleagues who may not be part of OCA as well. 1) There are NO cost savings to the State through this legislation. Our Board is entirely self-sustaining via license fees, so there are no revenues generated for the State or savings to the State with this bill. 2) The Boards are already operating efficiently. On average, each member of the affected Boards are responsible for monitoring 2135 licensees, and there is an average of one Board investigator for every 8081 licensees. The proposed legislation would place only 1 counselor on the Board to be responsible for all counselors in the State, and/or would place monitoring of our profession in the hands of those who are not counselors. 3) Placing responsibility for our profession in the hands of those not trained in our field could jeopardize the population that we serve. 4) Reducing the number of Board members would slow the licensure process considerably, making it more difficult to become licensed in the State when there is already a deficit of professionals to meet the demand, especially in light of the current opiate crisis. 5) Other states that have tried to consolidate their boards have not had good success with such a plan and have gone back to more distinct governing boards. Thank you for following up on this most urgent matter. We were able in December to forestall this, and we need now to redouble our efforts to stop this again. Please spread the word! The OCA is fortunate to employ the services of lobbyist Amanda Sines and the Government Advantage Group. 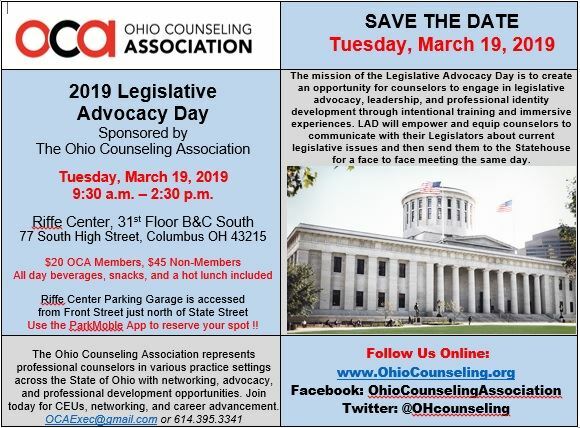 Periodic legislative reports, detailing current initiatives of the Ohio General Assembly impacting the practice of counseling, are available to all OCA members. This represents a primary benefit of OCA membership. Click on the downloads below to view current legislative information impacting the counseling profession. NBCC January 2018 Newsletter - Sean Gorby, the OCA Government Relations Chair, asked for this to be posted for all OCA Members to see. It concerns OCA's efforts to get Senator Portman to approve Senate Bill 1879 which would allow Counselors to bill Medicaid for services. Matt Fullen was a guest expert on All Sides with Ann Fisher (89.7 WOSU) the week of May 10. Listen to the show (he comes in around minute 15):Matt was the 2016-17 OCA Government Relations Chair and testified in a legislative hearing on Thursday May 11, 2017 as well.